Don't judge a house by its cover. Meth labs have been found in every kind of home in every state in the U.S. Protect yourself and your family by learning about the history of a home that you plan to buy or rent. Meth lab homes are not only a problem for home buyers, they’re also a problem for realtors, appraisers, Home Inspectors, and utility employees for reasons that go far beyond the difficulties you may have in selling them. Homes where meth has been cooked are considered to be hazardous waste sites, by U.S. Environmental Protection Agency, otherwise known as the EPA. Included in this rising cost of addiction, rental homes, apartments, storage facilities, and motel/hotel rooms. 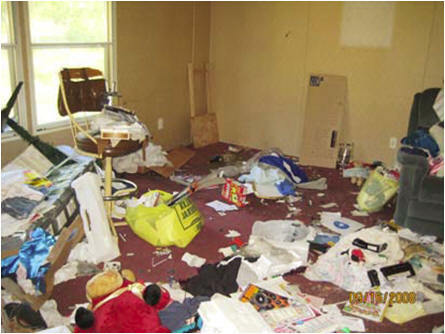 Chemical staining on walls and floors often result when chemicals spill during the meth cook. 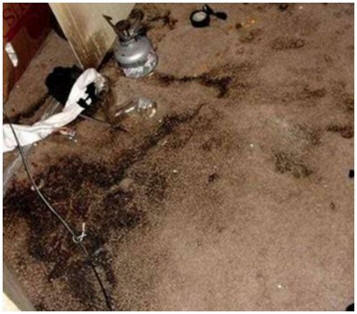 Floors and carpets are often stained or damaged by meth chemicals that can include liquids such as hydrochloric acid. A former meth lab may also have brand new flooring and carpets, which can signal that the previous flooring was damaged because of meth lab chemicals spills. Fixer-upper buyers beware! Also, keep in mind that meth lab homes may look brand new and not show any of the damages you see in the picture above.